On my last visit to Iowa, I observed a new road trip game. 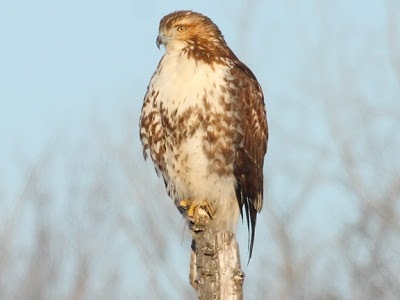 As one drives the lonely, two-lane blacktops in the Hawkeye State, there are numerous red-tailed hawks sitting on fenceposts, telephone poles and signposts. The object of the game, is to honk your car horn as you pass the hawk, hoping to get its attention. Of the 20 or so hawk-honkings that I witnessed, I was amused to see that 95% of the hawks paid absolutely no attention to the honking what-so-ever. I still believe that the one that moved was nudged by a strong gust of wind.